The other day I was frequenting Walgreens because I dislike other pharmacies… not sure why but that’s for another time. Anyway, I was wandering around Walgreens and checked their soda selection as I so often do. Normally Walgreens is where I get my Jelly Belly Soda but this time I noticed they had a new flavor of Deerfield Soda… Concord Grape! 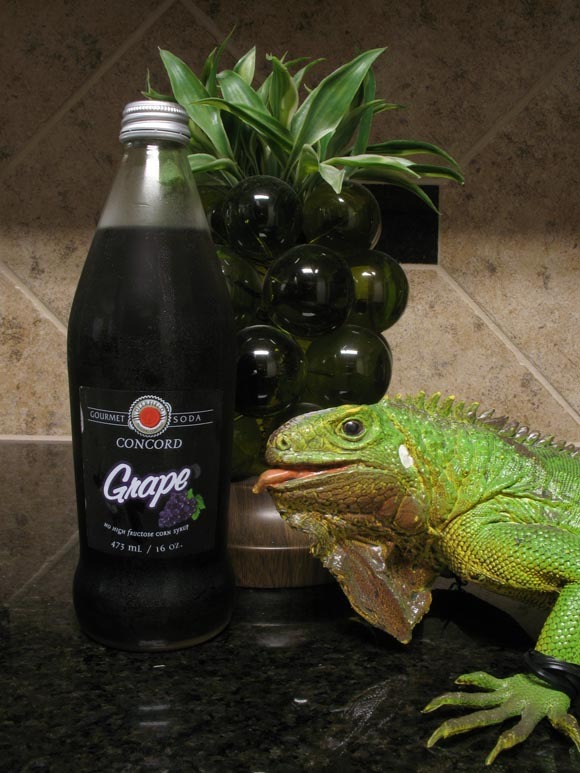 Since I hadn’t had a good grape soda in a while I figured Deerfield Concord Grape would fit that bill rather well, being that they tend to make excellent products! I’ll warn you who haven’t experienced Deerfield Sodas… don’t scoff at this Walgreen’s made soda! It uses cane sugar and is normally quite the treat! Let’s open her up! Grape just came out of the bottle and smacked me across the face. I didn’t even get a chance to put my nose near the mouth and I was assaulted with grape aroma. Taking a now pointless whiff I am once again clearly reminded of what flavor of beverage I’m about to partake in. This is definitely a top 10 in scent strength of all the sodas I’ve ever tested. Let’s see if the taste is just as strong. The flavor is of course grape and not a weak grape by any means. It’s more of a smooth grape soda which is a bit off putting to me because I prefer my grape soda with some bite to it. Drinking this reminds me of the TV show Firefly. It was a fantastic show and most anyone who sees it will agree with that statement. Another thing most everyone agrees with is that it was cut short in its run. That’s the feeling I’m getting with this Deerfield Concord Grape it lacks a solid finish but unlike Firefly it’s actually the fault of the soda not the fault of the show. Firefly couldn’t help that it was cancelled robbing us of seasons of potential happiness. Deerfield could have strengthened their soda by adding a bit more carbonation to it… or some sort of finish. This isn’t to say that it’s not an ok soda… it is but it could have been so much more… so much more… shiny.